You are here: Home / Cleaning / What is Washing Soda? A. A soda such as RC cola used to help swallow a moon pie? B. A type of ginger ale used to clean clothes? The answer is A of course. Just kidding. Continue reading to find out the correct answer. Washing soda or soda ash has been used by man for thousands of years. It was used by the ancient Egyptians and the Romans to make glass. It was extracted from the ashes of burned plants and that is why it used to be called soda ash. Washing soda is a chemical compound composed of sodium, carbon, and oxygen called sodium carbonate. It has the chemical formula Na2CO3. In the United States, most sodium carbonate is produced from trona. Trona is a mineral that was created by lake evaporation long ago. There is a deposit near Green River, Wyoming that is the largest known deposit in the world. There is also a laboratory method called the Solvay process that uses salt and limestone to make sodium carbonate. This is primarily used in countries other than the United States. Although sodium carbonate has many uses, we are interested in what it can do for our homemade laundry detergent or other homemade cleaners. Is Washing Soda and Baking Soda the Same Thing? Washing soda is a different chemical compound than baking soda. Baking soda(NaHCO3) is not as effective at water-softening or laundry cleaning as washing soda. The reason washing soda is more effective is related to the extra sodium atom present in the molecule. We won’t go into the in-depth chemistry of it all. Just know that there is a reason why one is called washing soda and one is called baking soda. It helps to precipitate dissolved minerals out of the wash water before the minerals have a chance to react with our laundry detergent. This process is called water softening. The washing soda is sacrificing itself to save our detergent. This means we can get more cleaning power out of a given amount of detergent. The high alkalinity of the washing soda allows our homemade laundry soaps and detergents to cut through greases, waxes, and oils better. 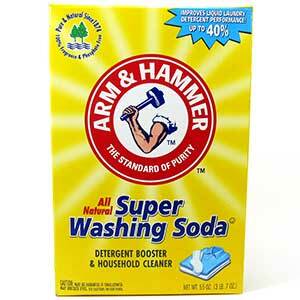 Arm & Hammer Super Washing Soda is one of the few brands of washing soda that is readily available to the public. When mixing and working with washing soda, it is a good idea to wear rubber gloves. 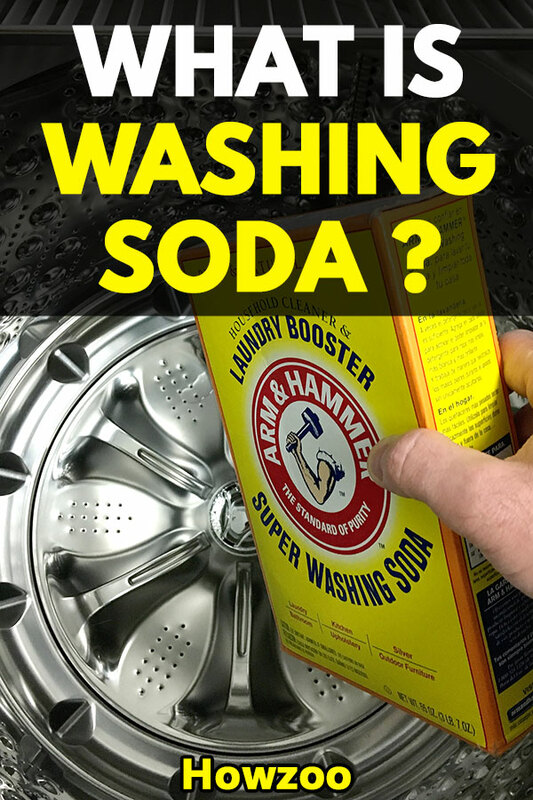 Washing soda is caustic and will irritate the skin. Take care not to breathe the dust or get it in your eyes. Also keep washing soda out of reach of children. Washing soda is a very versatile cleaning agent that can be used in many areas of the home. It can scratch or corrode fiberglass or aluminum surfaces and therefore is not recommended on these surfaces. Howzoo will explore the many uses of washing soda in future articles. We hope you found this article useful and we welcome your comments and feedback. When the swimming pool needs the ph raised, washing soda is a much more economical alternative than the expensive material in a plastic pail from the pool supply store. This is true. A while back I did some research into the cheapest reasonable source of soda ash. I discovered that the Arm & Hammer washing soda from the store cost about the same per pound as the 50lb bulk containers that I was finding online. I am now content to just buy the 55oz box at the local store. What is the difference between washing soda and borax. Is one product a better laundry booster than the other? Thank you. Borax is sodium tetraborate. It softens hard water and is a natural alternative to color-safe bleach. Washing Soda is sodium carbonate. It is also a water softener. I would say that borax is better at whitening but washing soda is a much stronger laundry booster. If I could only pick one, I would use washing soda.